Delta Force 1: If ever there was a game that proved the value of gameplay over graphics, it's Delta Force. At first glance, NovaLogic's Delta Force doesn't look like the sort of action game you might expect to see here at the tail end of 1998. After all, a game in this genre has to be 3D accelerated to be good, right? Not necessarily. If ever there was a game that proved the value of gameplay over graphics, it's Delta Force. Delta Force is a game of special forces combat against terrorist and insurgent forces. You can play the game from either a first- or third-person viewpoint. You can even do both at the same time, thanks to the picture-in-picture feature that lets you see your first-person view in a small window while playing the game from a third-person POV. 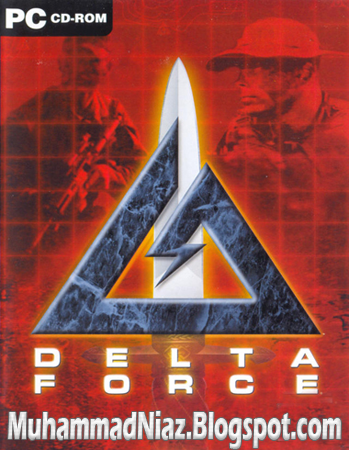 While comparisons to Rainbow Six are inevitable, Delta Force bears only a passing similarity to Red Storm's tactical shooter. For starters, you do not plan your own operations in Delta Force; they are assigned to you. You also do not have the luxury of working with seven squad mates. You will typically have two to four other soldiers in the field with you, but they make up separate assault teams that you cannot control (and which often have separate, specific mission goals). Finally, each of the game's 40 missions takes place in the great outdoors. The only real similarity between the two games is the special forces angle and the semirealistic action where one shot translates into one kill. Delta Force includes five single-player campaigns, each against a different foe in a different theater: a drug lord in Peru, terrorists in Chad, terrorists in Indonesia, insurgents in Uzbekistan, and more terrorists on the Russian island of Novaya Zemlya. The foliage (which is universally sparse), the buildings, and the bad guys all vary from region to region, though the landscapes are all pretty much the same except for color changes (green for jungle, tan for the desert, white for the snowy arctic circle, and so on). Rolling hills and plains pitted by deep, smooth canyons are pretty much the standard terrain type here. Most of your missions involve finding and eliminating an enemy base, but these are well varied because of differences between the many bases you attack. At the beginning of the game, for example, you'll encounter enemy strongholds that are typically guarded by foot soldiers, a few roving patrols, and maybe a guard tower or two. Later on, these bases become much more formidable, with bunkers, razor wire fences, increased patrols, and even a few enemy helicopters. The attack-and-destroy missions are interspersed with a healthy number of other scenarios. For example, there are a few missions where you will have to infiltrate a base to steal a laptop or some other source of intelligence data. Others include rescue missions, convoy ambushes, and (in one of my favorites) laser-designating targets for naval bombardment. Overall, the mission design in Delta Force is very strong. Another positive note is the fact that you have a lot of control over the order in which these missions are completed. You can even skip around from theater to theater, if you like. And even though the basic goal is pretty much the same throughout (kill all the bad guys and make it to your extraction point alive), the mission specifics are varied enough to keep things exciting, challenging, and reasonably fresh. One point where Delta Force could stand some improvement, however, is in the mission-planning phase. As mentioned earlier, you have no say in the mission plan itself. You can alter your starting equipment and weaponry, but the mission waypoints are fixed - and suicidal. Nearly every mission is planned out so that your first dozen or so steps will take you straight into the heart of heavy, concentrated enemy fire. The best way to complete most missions is to ignore the waypoints entirely and make your way slowly around the objective, sniping all visible bad guys from extreme range before moving in to mop up the survivors. Unfortunately, the movements of your fellow soldiers seem to be triggered by the waypoints, so they will not always move if you don't walk over a particular spot on the map. This was especially evident on the last mission in Novaya Zemlya, where my pals in Charlie Team stayed safely hunkered down in a ditch - about 10 feet from a group of four terrorists - throughout the entire mission. Then again, the computer-controlled good guys aren't often much help anyway (particularly Charlie Team, which was about as useful as red shirts in Star Trek). For some reason, these poor fools got wiped out early in almost every single mission, often before I could even make it to my first few waypoints (maybe that's why they wouldn't leave their hole on the last mission…). The AI for enemy troops, on the other hand, is quite good. Unlike in Rainbow Six, a bad guy in Delta Force will most certainly respond when you blow away his buddy - and so will a dozen or so of his comrades. Opening up with an automatic weapon from an unprotected spot is sheer suicide, as the bad guys will quickly home in on your stream of fire and wipe you out. Also, a few shots in the wrong place or at the wrong time will bring in hordes of reinforcements to make your job more difficult. Still, for the sake of playability and game balance, the bad guys generally present you with a good target and pause enough between shots to give you ample time to react to an attack. Your ability to locate and kill your enemy, however, is directly proportional to the speed and power of your PC. Based on NovaLogic's highly tweaked Voxel Space 3 engine, the unaccelerated graphics in Delta Force are functional, with even an occasional hint of brilliance - but only on a well-equipped Pentium II machine. The game's minimum spec calls for a Pentium 166 with 32MB RAM, but on a Pentium 233 with 64MB RAM and a 12MB Voodoo 2 card, the game crawled along at any resolution higher than 512x384 at 256 colors and looked just plain ugly at any of the lower settings. Unless you have at least a Pentium II 300 with 64MB RAM and an 8MB video card, you will have a hard time picking out enemy troops from the multicolored chunks that make up the landscape. NovaLogic is reportedly working on a 3Dfx patch that will accelerate the character animations and the building rendering (all of which is polygonal), but no release date has been set for that patch. Still, the tepid graphics engine does not ruin this game. So long as you have the hardware to run it at 640x480 with 16 million colors (the aforementioned Pentium II 300 can do this just fine), Delta Force can actually be quite impressive from a visual standpoint. The maps are all very well designed, as are the various bases, airfields, and other objectives you'll encounter. The player and enemy animations are excellent and realistic. The death animations even vary depending on where a character is shot. And the rolling terrain makes sniping a real challenge, as you often have to wait for a bad guy to pop up from behind a rise before pulling the trigger. The idea was to create believable outdoor environments where combat could take place at extreme ranges (we're talking about distances of up to a kilometer here), and Delta Force truly delivers in that respect. The game's Dolby Pro Logic 3D positional sound and excellent sound effects make the battlefield even more realistic and immersive. The sound of bullets whizzing by is often the only indicator you have that you're under fire. When you hear slugs hitting the ground all around you, you know that it's time to move and move fast. Also, the shouts of your enemies (which come complete in a language native to the theater) will let you know whether or not you've been spotted. Once, after shooting a Peruvian at point-blank range, I heard him yell "Medico! Medico!" before crumpling to the ground. The weapon sound effects, from the suppressed H&K MP5 to the mighty M249 SAW, are utterly fantastic - possibly the best I've ever heard. In multiplayer games, the weapon sounds of 32 players combine into an unforgettable din. When you enter a multiplayer game of Delta Force on NovaWorld, NovaLogic's free gaming service, you will feel like you're entering a real combat zone. In general, multiplayer games of Delta Force are incredibly fun - when they work. NovaWorld is very obviously lacking in the bandwidth department, and reports are flying all over the Net about difficulties getting this game to work well over modem and generic Internet links. Still, if you catch NovaWorld on a good day and at a good time, you're in for a treat. Delta Force online is one of the most enjoyable and thrilling multiplayer experiences I've ever had. Game variants like capture the flag, king of the hill, and team deathmatch are a real blast no matter how many players are in a game. While the game has several flaws, such as horrific warping, questionable stability, and bizarre scoring glitches, it's still a lot of fun. Hopefully, NovaLogic will address the game's problems in a patch or two. One feature it should add is the ability for players to start their own games on NovaWorld (currently, you are limited to a set number of games already in progress). And for all you deathmatch purists out there, forget all that crap about the evils of camping. Sniping is the key to victory in Delta Force. If your CTF team does not have a sniper or two in the hills, for example, you simply will not win. Delta Force is a very impressive game overall, despite the limitations of the graphics engine and the multiplayer flaws. The excellent single-player gameplay, the solid multiplayer component, and the incredibly immersive battlefield environment make for a truly impressive game. Any action fan who is open-minded enough to look past the graphics engine will see a game that easily ranks with Rainbow Six as one of the year's best "alternative shooters." Just make sure you have a powerful system, otherwise you'll waste all of your ammo firing at pixels you could almost swear had just been moving.